Police haven't said a word about it, but three prisoners escaped from the Corozal Police Formation's jailhouse just before 6:00 this morning. The prisoners include Marvin Pec, Johny Matus and Austin Sutherland who were all being held in a cell as they were scheduled to appear before the Court in separate matters today. But last night, instead of preparing what to tell the judge, the men instead spent the night sawing through the cell bars with some kind of blade or sharp object, making enough space to squeeze out, and then scaling the jailhouse fence to escape. All of it was captured on surveillance video - which apparently no police was monitoring. The prisoners also did their work around the schedule of officers who visit the cell block intermittently. But, police - probably too embarrassed - have said nothing about the escape; there has been no posters or pictures with the particulars of the men on the run, and no official information to the media. Pec was recently charged by the Police for aggravated burglary, Sutherland was on remand and was to appear in court in relation to a 2013 burglary case, and Matus was also on remand for alleged burglary. While the men are not considered dangerous, that they are on the run - and that is always dangerous. A trio of prisoners sawed their way out of the Corozal holding cell just before 6:00 on Wednesday morning - and police didn’t say a thing about it until today at the weekly press briefing. "On Wednesday, April 2018 the police officers at the Corozal police station were preparing to ferry prisoners from Corozal to the Kolbe Foundation. This was sometime around 4:50 AM and in that process they discovered that 3 metal bars for the cell door were cut and 3 prisoners had escaped. Their names are Janito Matus, 19 year old of San Narciso Village; Marvin Peck a 28 year old of Consejo Road Corozal and Austin Sutherland 29 year old of G Street South Corozal Town. They had been detained for burglary and handling stolen goods. Mr Matus was serving time for burglary and he was at the station for another burglary case. They are still at large and if anybody has any information in regard to their whereabouts kindly call the nearest police station." "Are you about to say what instrument was used to cut the bars of the holding cell block?" “No, I don't have that exact detail in regard to the instrument." "Is there any indication to you as yet as to how these persons may have gotten this instrument while being in detention?" 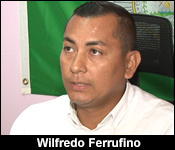 "I'm sure that the professional standard's branch are up in Corozal and they are conducting their investigation and after they have concluded with that maybe they will be in a position to comment on that. I don't have any details in regard to that but there is and there is always an investigation by the professional standard's branch whenever these incidents do occur." "How many officers were on duty when this happened because it behooves me that cutting of metal could be happening and nobody hears or how often would they actually patrol these cells?" Investigators from the Professional Standards Branch have been dispatched to investigate the escape, and determine if any of the on-duty cops at the time were negligent while on the job. There has been some suggestion that someone inside the station may have provided the blade used to cut the bars. One of the prisoners who escaped from the Corozal police station holding cell 13 days ago has been recaptured. Yesterday morning Police found Nineteen year old Johny Matus right in his home village of San Narciso. He was taken to the Magistrate's Court where he was charged for escaping lawful custody and damage to property. In Court, the prosecution said that the metal bars damaged is the property of the Government of Belize and it cost $350. Matus will return to Court on May 3rd. The other two Marvin Pec, and Austin Sutherland are still at large. On April 11th, the three prisoners sawed their way out of the Corozal Police Station cell-block #3 and escaped. Police still can't say how they obtained a sharp object to cut through the metal bars. Three prisoners from Corozal — Marvin Pec, Austin Sutherland and Johnny Matus, who broke out of the holding cell at the Corozal Police Station, have been recaptured. Pec and Sutherland were at large for twenty days before being captured. However, Matus was caught by police last week. The breakout occurred sometime between 4:00 and 6:00 on the morning of Wednesday, April 12. The three men sawed through three iron bars of the holding cell and escaped to freedom by scaling the fence that secured the compound. The police said that they conducted regular inspections of the cell block where the men were held, but the prisoners timed the routine of the officers doing night duty. Inspector Wilfred Ferufino said that police still don’t know where the men got the object they used to cut through the bars in the cell. He said that that they were conducting an internal investigation into that matter. Matus, 28, was nabbed while he was sleeping in his house in Ranchito, Corozal District. Pec, 20, and Sutherland, 29, are at the Corozal Police Station. They were found hiding in the Orange Walk Town Cemetery at about 1:30 yesterday. They are awaiting arraignment for escape from lawful custody. Pec will also be arraigned for handling stolen goods, while Sutherland will also be arraigned for aggravated burglary. At the time of the escape, Matus was serving a sentence for burglary, and was going to court for another case, while Sutherland and Pec were being taken to court to answer to the previously mentioned aggravated burglary and handling stolen goods charges. ASP Alejandro Cowo said that police conducting a patrol saw both men in the cemetery and arrested them without incident. Late information to us is that the investigation into the escape, which was carried out by the Professional Standards Branch, has concluded, and as a result of the enquiry into the matter, a policeman was transferred, and disciplinary charges were brought against another. Two prisoners who had remained at large after escaping from the Corozal police station on April 11, were recaptured this week in the Orange Walk cemetery. According to Officer Commanding CIB Belize City, Alejandro Cowo, police received information that the escaped prisoners were hiding in the cemetery. Police visited the area around 10:00 p.m. on April 2nd, where they met and apprehended Austin Sutherland and Marvin Pec. Both men were taken into custody and charged with ‘escape from lawful custody’ and ‘damage to property’. Last week, their companion Johnito Matus was also recaptured at his home in San Narcisio village. After the prisoners escaped, the Police Department launched an internal investigation and charged three officers attached to the Corozal police precinct with, ‘allowing a prisoner to escape’ and ‘neglect of duty’, to which they all plead not guilty. 2 registered members (Judyann H., kkare), 240 guests, and 8 spiders.